While it’s no secret that Memphis has a wealth of musical talent, the wealth that those artists should be pocketing often remains unknown, even to them. To help change that tune, the Memphis Music Foundation is collaborating with SoundExchange, a performance rights organization, to locate unclaimed money owed to Memphis artists. 10, more than $65,000 in royalties has been distributed to local musicians, and the MMF wants to help others claim thousands of dollars in additional uncollected royalties. One of the local organization’s primary missions is to educate artists about the business side of the music industry and to help them make money, said Pat Mitchell Worley, director of development and communications for the MMF. “Digital has been a godsend for many independent artists because of increased exposure, but too many of them are missing out on royalties from that exposure,” Worley said. That’s why the MMF is stepping up efforts to encourage its members — as well as local artists who aren’t affiliated with the organization — to register with SoundExchange. There’s no cost to sign up, but the potential payoff could be significant. Memphis artists receiving royalties collected by SoundExchange include the 8Ball and MJG, Magic Kids, Preston Shannon, and Project Pat. Established in 2003, SoundExchange is a nonprofit performance rights organization that collects royalties on behalf of sound recording copyright owners — typically record labels — and musical artists for digital performances. Fourth-quarter distributions of royalties for 2011 were nearly $90 million, with year-end royalty payments exceeding $290 million. The organization has paid out more than $900 million in collected royalties since its inception and that figure is expected to keep growing. Last year SoundExchange performed more than 80 database matches with partner organizations such as the MMF and registered more than 15,000 new artists, labels and rights holders. And while many top-name musical artists are registered with SoundExchange, the group primarily helps independent artists. In fact, 90 percent of the royalty checks distributed by the organization are for under $5,000. And the agency also benefits legacy acts and estates. For example, artists whose music was recorded decades ago — but is still being played on digital oldies stations — also may be entitled to uncollected royalties. “It’s not just the superstars, but up-and-coming artists and some of them who are no longer performing or their heirs who stand to benefit from signing up with us,” said Marie Knowles, vice president of communications for SoundExchange. What: Nonprofit performance rights organization that collects statutory royalties from satellite radio such as SIRIUS XM, Internet radio, cable TV music channels and similar platforms for streaming sound recordings. Cost: Free registration, but organization keeps back 6.7 percent of collected royalties to pay for operating and administrative costs. April is Financial Literacy Month and your music business can’t grow without sound fnaicial planning. Here’s a blog dedicated to teaching musicians about money management. Join us this weekend for a workshop on merchandising and branding. We have put together a great panel of experienced branding professionals to discuss branding basics, graphic design, digital sales, tour merch needs and general image strategies that fit your sound. Feel free to bring your material for review and direct consultation. Their combined clients lists have included Atlantic Records, Epic Records, MTV Networks, Paramore, Toby Keith, and Lady Antebellum. Some conversation topics will include what branding is and how it relates to bands, how to use social media to maximize the power of the brand, and when to consider a marketing firm or graphic designer, to name a few. Moderator Larry Robinson: Creating Lasting Perceptions in 1997, Larry has carved out a niche as a “Marketing Guru”, as noted in a national periodical, for his innovative work in the healthcare, spiritual and cause related marketing. Over the years, he has created segmented and integrated marketing programs for various government and corporate entities. He formerly worked for one of the largest children’s healthcare charities in the world, as their Director of Multicultural Marketing, and two of the world’s largest pharmaceutical companies in sales and marketing. Present and former clients are: Nike, Anheuser-Busch, National Basketball Association, Coty Fragrances, L’Oreal, SoftSheen-Carson, Motown Records, Merck, Ortho-McNeil Pharmaceutical, FootAction USA, Atlantic Records, Epic Records, St. Jude Children’s Research Hospital and Methodist Healthcare. John Sylvester: As an Entrepreneur and small business advocate John has been fostering growth in people and their organizations across the country for over a decade. Skilled in strategic and organizational development, John has worked with some of the brightest minds in the Entertainment, Real Estate and Professional Service industries. In 2010 he Co-founded Sache Clothing and Design. A lifestyle fashion and design company born right here on South Main. John is a graduate of the University of Mississippi, holds an MBA from Mercer’s Stetson School of Business and Is a licensed affiliate Real Estate broker in Tennessee. Bruce Fitzhugh: Bruce Fitzhugh started in the music business at the age of 18 when his metal band Living Sacrifice was signed to a recording contract in 1991. Since then he has toured the world and performed multiple duties and manager, booking agent, and product development. In 2003 Fitzhugh relocated to Nashville TN and started an ecommerce and merchandise company Zambooie.com. Since that time Zambooie has been absorbed into Music City Networks, also in Nashville TN. The combined company now handles website, ecommerce, fanclubs, digital strategy, branding and merchandise for a number of clients from Lady Antebellum and MTV Networks to Paramore and Underoath. Joel Halpern: Joel Halpern is a native of Memphis who has lived in New York and Paris and has always had a passion for the entertainment business. He has held various creative jobs in advertising/branding agencies in NY and Memphis. 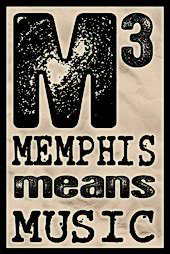 As Marketing Director, he helped re-launch the Memphis based St.Blues Guitar Co. He has managed and worked with several bands, including Kuroma , MGMT and The Dynamites. While working with the marketing firm the Musebox in NY, he was responsible for several branding overhauls for bands and independent record labels. Currently Joel is Creative Director for ABC24/CW30 here in Memphis. Young Jai sees dance as a integral part of his music. The hip hop artist has been a supporter and promoter of Memphis jookin’ for years. He has captured many of the acts with his camera and formed relationships with some of the city’s top dancers. Here in the River City, Jai has been a favorite when jookers to showcase their moves. Young Jai is making his own moves in the rap game with his new album, Art Official, which dropped this week digitally with Island/Def Jam South. Young Jai first gained international notoriety through his DVD release and YouTube video, Memphis Jookin Vol. 1 which featured his raps over the best “jook” street dancers in Memphis. The compilation helped revive the jookin’ dance style while giving Jai a platform for his raps. He later released his mixtape, The Memphis Makeover on the heels of its success. Art Official marks Young Jai’s first album for digital distribution with Island/Def Jam South. The mixtape’s first single, “Aye Boo” is being promoted heavily nationally to club and radio dj’s by Hittmenn Dj’s as well as Core Dj’s. 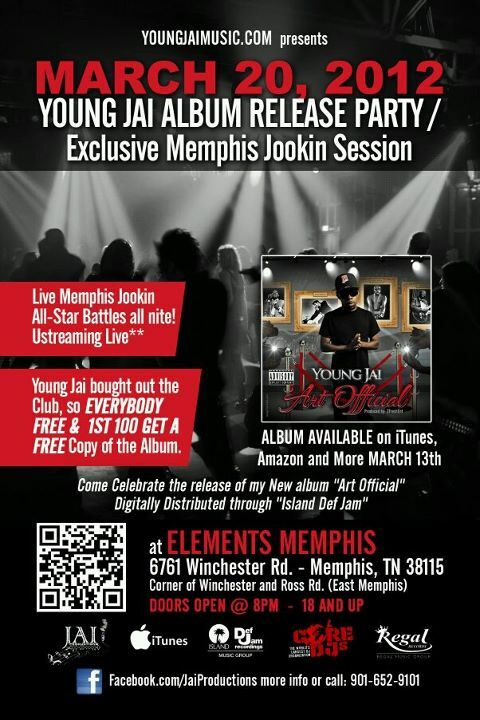 Young Jai will host a CD release and jookin’ session at Club Elements on Tuesday March 20th. Start your year off right with a fierce social media campaign! This article from Hypebot describes how to interpret the results of an artist’s social media progress. It is important that artists understand how their number of “Likes” and fans on networks like Facebook and Twitter are generating awareness within their social media community. Increasing one’s virtual fanbase should ultimately lead to greater brand recall. That is the most important factor for artists to consider when arranging their social media strategy. Read on to discover just how one’s virtual fanbase can be increased! For the second time, Minglewood Hall will play host to Lucero’s Annual Holiday Show on December 22nd at 8 pm. Lucero has teamed up with the GRAMMY Foundation, MusiCare, and will be donating a portion of the proceeds from the show . Released in October 2009, Lucero’s sixth studio album and major label debut, 1372 Overton Park, shows a turn towards the sound of Memphis soul that has long structured Lucero’s records. Beginning this fall, the band has toured in support of the new album with a traveling roadshow featuring Amy LaVere, called the Lucero Ramblin’ Roadshow & Memphis Revue. Lucero chose to donate to MusiCare because it offers a safety net of support for music people in critical times of need. MusiCare covers a large span of financial, medical and personal emergencies, and each situation is treated with honesty and discretion. MusiCare focuses the resources and concentration of the music industry on human service issues that promptly influence the strength and wellbeing of the music community. 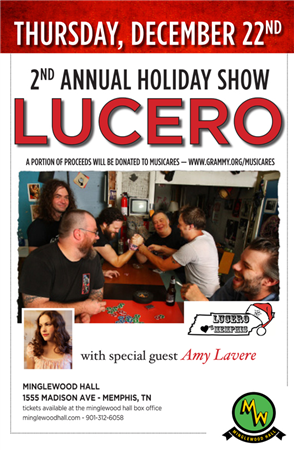 You can purchase tickets to Lucero’s 2nd Annual Holiday Show at www.minglewood.com. You can also learn more about MusiCare at www.grammy.org/musicares. 2011 is wrapping up and those cold, slow winter months often end up being less full of gigs as everyone prepares for the holidays. “So how do I squeeze the most productivity out of December and prepare myself or my band for a big year in 2012,” you may ask? Well, we’ve put together a list to help you get organized and ready to tackle the year with a running start. Tax Preparation – Though “taxes” may be among the most dreaded words in any language, there’s nothing worse than ignoring the tax man until he comes after you for big bucks (or at least more than you should have to pay). Here are a few things to get lined up to make tax season less painful. 2) Keep track of your income sources – digital downloads, record sales, merch sales, performance money, licensing money. 5) Create a business entity – LLC, S-Corp, C-Corp, or Sole Proprietorship – contact the MRC if you need a basic explanation on these. LLC is usually the safest and best bet for touring bands. 8) Collect info on your 1099 contractors you have paid over $600 to in a calendar year. They must be mailed by Jan 31st! 9) Designate someone to be in charge of the bands finances. Ideally, that person is a business manager and/or CPA. At the least, one of you should be able to manage the Quickbooks and then hire a CPA to handle taxes at the end of the year. If you keep good records, the cost should not be high. You can also consider paying your taxes quarterly.